"My friend and I got one of these at a Cavs game last season. We were having fun with Tyson Chandler and he started jawing back at us. We didn’t swear or say anything bad. We had to go in a room with security and a cop and give them our ID or they said we would have to leave the game. They said it was to protect us in case we filed a complaint because they said Chandler swore at us." I asked Shane if he could share what his friend said to Chandler. "Chandler was crying to the ref about a foul, so my buddy told him to ‘stop being a crybaby.’ This was around the end of the first quarter. For the rest of the half, Chandler would look our way and point or say something everytime he went up and down the court. After he scored, he looked at us and pointed and then we yelled back that he only had 4 points and told him to shut up. It was all in good fun, no swearing or insulting someone’s mother or anything like that. "The best part was at halftime when the rest of the players were walking to the locker room, Chandler came walking to our section yelling things (we never could actually hear a word he said) and then pointed for my buddy to meet him over where he had to go to get to the locker room (presumably to throw down, which would never happen). Nothing happened until the end of the third quarter when security and a Cleveland cop told us we need to come with them. They said he swore at us and they wanted to have our info in case we filed a complaint. "We never really got an answer as to why we should get a warning for him swearing at us, but they told us if we didn’t give them our IDs we’d be escorted out." 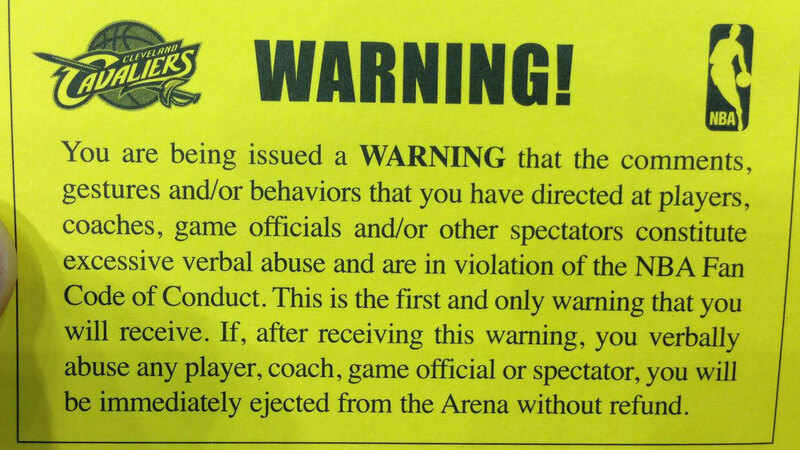 So, yes, apparently these warning cards are real, so please be on your best behavior at NBA games. UPDATE: Via Darren Rovell, the NBA says they’ve been handing out these cards since 2005.